Many women find that morning sickness starts to settle down after this point in pregnancy. You might be having leg or foot cramps – this is common. Make sure you get lots of calcium by eating calcium-rich foods like milk, cheese and yoghurt, and stay active. If you have special dietary needs, seeing a dietitian might be a good idea. 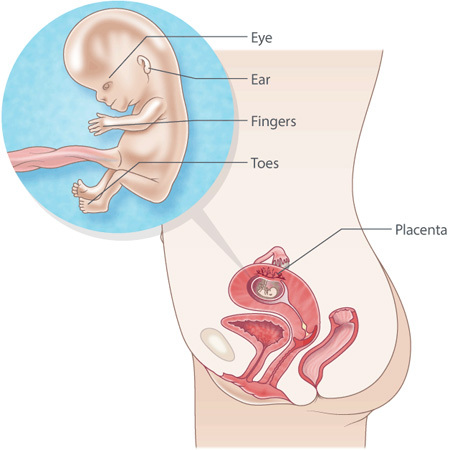 You can have this ultrasound scan at 11-13 weeks of pregnancy to check your baby’s development. It will also show if you’re having more than one baby. It can be really exciting – it’s often when you get to see your baby for the first time. But this ultrasound scan is usually also part of a screening procedure that checks your baby’s risk of having a condition like Down syndrome. It’s a good idea to think about how you might feel and what you’d do if you’re told your baby has a high risk of complications or an abnormality. If you need to, you can talk about this with your partner or another trusted person or health professional. Dads – not real yet? Some men find it hard to feel the pregnancy is real. Before they see the first ultrasound, they might find it impossible to believe there really is a baby. Often, once they hear your baby’s heartbeat or see your belly getting bigger, the pregnancy begins to seem real. You have to give permission before you have tests or scans during pregnancy. If you don’t understand why you need a test, medication or treatment, it’s OK to ask for more information. Ask your doctor or midwife what the test is for, why it’s needed, and what could happen if you choose not to have a test. It’s about 4.5 cm from head to bottom. It weighs about 10 gm. The heart is completely formed and pumping. The brain and nervous system are almost finished developing. Nerves and muscles are starting to work together. This means that your baby is starting to make small, jerky movements. It’s too early for you to feel them, though.